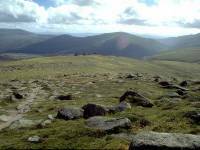 Bynack More (or Ben Bynack, or Beinn Beithneag) rises to an altitude of 3576ft, or 1090 meters, and is the 54th highest summit in Britain. 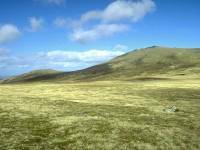 It's the highest point of a vaguely wedge-shaped piece of land lying mainly between Strath Nethy and the Lairg an Laiogh. 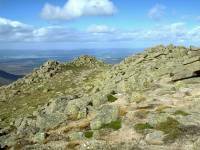 The well-known footpath of that name crosses the neck of this ridge just north of Bynack itself; beyond here the ridge fans out north and northeast into an area of indeterminate and inhospitable country containing the Braes of Abernethy and the moor of Caiplich. 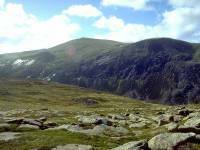 The ridge is bounded in the south by the upper reaches of the Avon, and it joins the main Cairngorm massif itself at the Saddle, the col at the head of Strath Nethy. 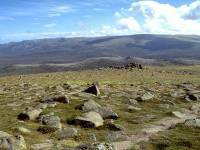 The Bynack plateau is, like most of the Cairngorm massif, a vast, gently-rolling upthrust of pink granite carpeted by mosses and short, wiry grasses. 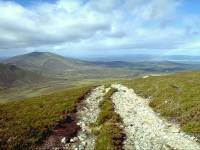 It's superb, easy walking terrain and the fact that the Lairg an Laiogh runs within a mile of the summit dome makes this a very straightforward climb. 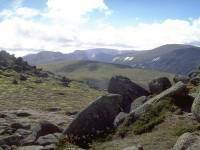 Indeed, with an entirely hassle-free ascent of around 2600ft from the usual starting point at Loch Morlich, Bynack More must rate as one of Scotland's easiest high mountains. Provided, of course, that you're prepared for the distance. It's around 8½ miles from the starting point to the summit, so you're looking at a round trip of 17 miles at the very least. 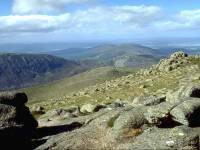 Fine, settled weather is a must for the ascent of Bynack. 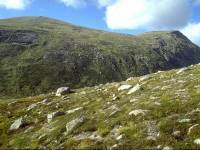 I did this walk on 9th September 1999, two days after the Drymen to Rowardennan walk chronicled elsewhere. 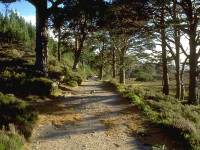 It began with a bus ride from Aviemore to the Glenmore visitor centre by Loch Morlich. 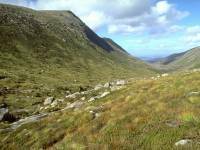 The route starts off along the track to Glenmore Lodge and continues along the forest road through the Ryvoan pass, sandwiched between Meall a Buachaille on one side and Creag nan Gall (an outlier of Cairn Gorm's north ridge) on the other. The weather was a little odd. It was predominantly sunny, yet there was an almost continuous fine drizzle drifting through the pass. Here we're pretty much at the summit of the pass, looking back at Lurcher's Crag and the Chalamain Gap. I'd just passed An Lochain Uaine, a mountain pool which all the guidebooks reccomend as a scenic highlight; sadly, I couldn't get a decent composition of it. Oh well, it'll still be there next year. 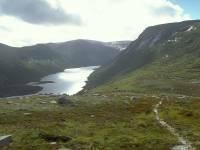 A couple of hundred yards short of a little hut called Ryvoan Bothy, almost 3 miles out from the Glenmore visitor centre, the route turned right (or east) to loop around the northern end of Cairngorm's long northern ridge. 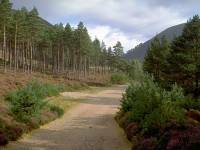 The other track, continuing to the north, leads into Abernethy forest and ultimately to Nethy Bridge. 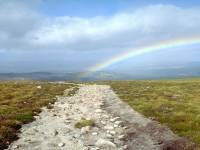 The new track, just over a mile long, overlooks Abernethy Forest and passes the gloomy An Garbh Choire, dividing Mam Suinn and Creag nan Gall at Cairn Gorm's northern extremity. A sharp shower raced over as I walked past the mouth of the corrie. The vehicle track comes to an end here at the river Nethy. A mountain refuge hut, the Bynack Stable, stands here just to the right - I didn't take a photo of it as it's nothing more than an uncompromisingly ugly corrugated iron shed. There's an unfortunate tendency in Scotland for plonking plug-ugly structures in the midst of outstandingly beautiful scenery. That's Bynack More on the skyline, just left of centre, the first time it comes into view on this walk. It looks quite do-able from here. I stopped here for a morning refreshment break. It was rather fortunate that the Bynack Stable was here, ugly or not, because a nasty little shower rattled by and sent me scurrying for cover for ten minutes. 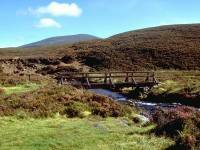 The bridge over the river Nethy that carries the Lairg an Laiogh track. 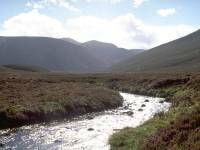 This ancient right of way crosses the Bynack More ridge then leads south, through Glen Derry and ultimately out to the Dee at Braemar. A right turn over the bridge leads you straight up Strath Nethy to the Saddle, the col between Bynack More and Cairn Gorm. There was still the occasional passing shower. 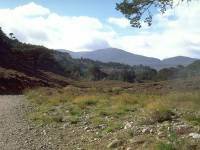 The sky was clearing yet the wind was increasing as I started up the Lairg an Laoigh. The track climbs a shoulder of Bynack More's north ridge. Although this is the steepest section of the climb it's not taxing. I'd rate it as easier than most Lakeland ascents. Here we're looking back towards Bynack Stable, with the Corbett of Meall a Buachaille beyond. 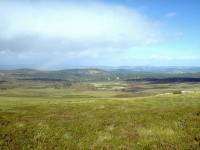 A view opened up over the vast sweep of Abernethy Forest as I continued to climb up the slope. Nearing the top of the slope now, and the gradient has eased. This really is a first-rate path. 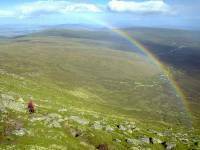 High on the Lairg an Laiogh track now, and as I looked back yet another sharp shower rattled past to the north. They were missing me now, forming a series of vivid rainbows a mile or two away. 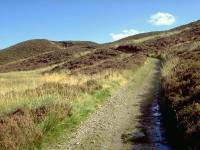 The path sped on across the plateau, firm under foot and gently graded. This really was a remarkably easy climb. 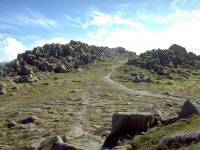 Just about a mile short of the summit dome of Bynack itself the main track veered off to the left. A sketchier yet obvious diversion headed south across the moor, directly for the summit of Bynack. Bynack More is seen here to the left, with its outlier of Bynack Beag to the right. 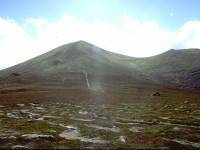 I wondered how often Bynack Beag was climbed. I bet it receives very few visitors. The easy walk was over. I'd reached the summit dome. There was a path pretty nearly all the way up. The climb was straightforward, mainly on grass and firm gravel, with a couple of rockier pitches. I was more worried by the wind than the terrain. It was blowing a real gale at this height and the temperature was plummeting. But, with nothing save the odd patch of fluffy white cumulus in the sky, I wasn't worried about the weather turning. And there I was. 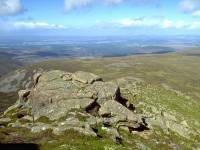 Bynack More, my ninth Munro. It was just on 1pm now and I decided that I'd stop for lunch. Not on the summit, however, for the wind was murder. I headed for the foot of the rock tower to the right of the picture. I sat and had lunch here as I watched the last of the day's showers track across the ridge to the north. The young woman in shot to the left was the only other human being I saw in nearly 6 hours. Although I sat in the lee of the wind the effective temperature was close to freezing - I had to wear gloves while eating my sandwiches. Bynack More isn't the first mountain to have played this trick on me and I'm sure it won't be the last. After finishing my lunch and climbing the final dozen feet or so to the summit I discovered that it wasn't the summit at all. Another, higher, peaklet beckoned several hundred yards to the south. 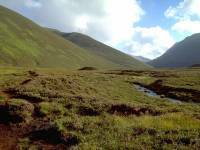 This is the view looking back towards Meall a Buachaille. 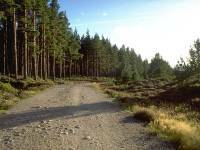 ...and, from the same point, looking across Abernethy forest to the lower Spey valley. 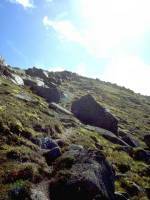 So, girding my loins once more, I clambered up towards the summit, straight into the sun and broadside to the gale. And when I reached the summit I found that it wasn't the summit at all. Another, higher, peaklet beckoned several hundred yards to the south. Girding my loins, (etc, etc). 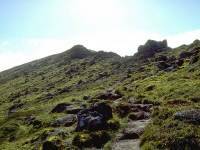 In fact the true summit turned out to be several hundred feet higher, and a good kilometre further south, than the north top that had been in view for most of the morning. I arrived there not long before 2pm, feeling a bit bushed by the unexpected effort but mainly by the battering from the wind. It was literally impossible to stand upright - I've never known wind like it, and it seemed completely incongruous under such a benign sky. I reckoned that it must have been gusting storm force 10 - an estimate more or less confirmed, a few days later, when I looked up the Cairngorm summit weather data and found that the wind speed was exceeding 70 knots at the time. 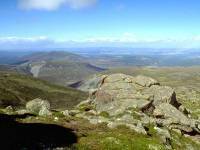 A hundred yards short of the summit and the central Cairngorm plateau came into view. 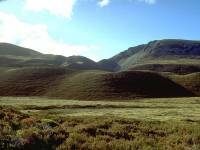 The whaleback lump in the centre of shot is Beinn Macdui. Beinn Mheadhoin lies to its left, with Cairn Gorm to the right. I reached the summit - and got straight off again. It was either that or get knocked to the ground by the gale. With my back to a passing rock outcrop I grabbed this shot of Ben Avon and Beinn a Bhuirdh to the south east. From the same spot, this is the view more or less due south to Beinn a Chaorainn. After a couple of minutes' break to reload the camera I clawed my way back onto the summit again. Leaning on a rock for support I grabbed this view of Beinn Mheadhoin and Beinn Macdui. The deep vee of Glen Derry is well seen towards the left. 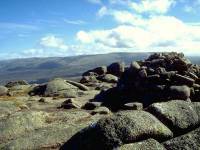 Looking north across the summit rocks to Abernethy. The summit cairn - with Beinn a Bhuirdh beyond. 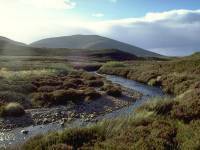 Another view of Mheadhoin, Macdui and Cairn Gorm. Decision time now. Go back, or go on? Despite the wind I still feel in the mood for a bit of an adventure. The sun is shining and it may be many years before I see this place again in similar conditions. 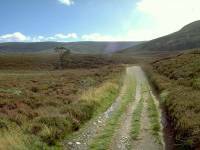 I decided to exercise an option and push on to the Saddle - here I might go for Cairngorm itself, or otherwise descend along the Strath Nethy path back to Bynack stable. The view here shows the scene to the northwest, with Meall a Buachaille prominent; closer to are the long top of Sron a Cha-no (sounds very oriental, doesn't it?) 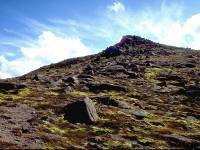 and the scree-girt Stac na h-Iolaire, both part of Cairn Corm's north ridge. 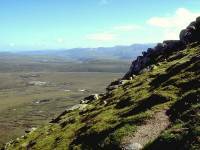 So I've left Bynack More to the south and have then tracked south west to the broad dome of A' Choinneach (elevation 1017m). It's a benign place of firm, dry turf. I bypassed the summit to the left. Had I realised that A' Choinneach was a demoted Munro I'd have paid it more attention and crossed the top. 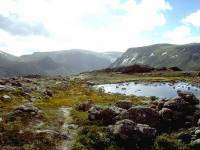 I also missed out the Barns of Bynack, which lie about 800m southeast of Bynack's summit. Reputedly they're the largest granite tors in the range, which in an area of such massive and prominent outcrops must be a really impressive sight. Oh well, they'll still be there next year. A bit of a dilemma here. According to the map I'm supposed to walk south off A' Choinneach and then track east, then south, then southeast to arrive at the saddle. In fact the lie of the ground didn't really seem to match the detail shown on the map. 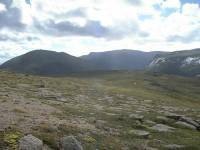 No matter - the terrain was easy enough and I just walked in the general direction of Beinn Macdui. I reckoned I was sure to spot the col below me before too long. 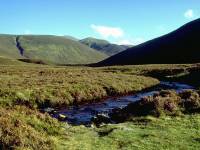 Cairn Gorm, and its prominent northeastern outlier Cnap Coire na Spreidhe, loom across the unseen head of Strath Nethy to the west. I came across a tiny lochan, with a bit of a sketchy path beside it. I could now identify that patch of bright pink rock on the slopes south of Cairn Gorm as Stac an Fharaidh. 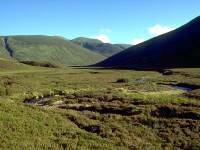 I reckoned I should be able to see Loch Avon once I came to that lip of ground beyond the lochan. And I was right! It was the first time I'd set eyes on this spectacular body of water since my first ascent of Cairn Gorm in 1975. 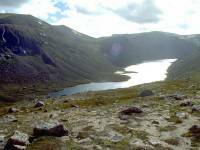 Loch Avon, elevation approx 2200ft, lies in a deep cleft between Cairn Gorm to the north and Beinn Mheadhoin to the south. 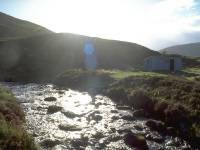 It drains eastwards into some of the emptiest, wildest country in Britain, north of the munros of Ben Avon and Beinn a Bhuirdh. The path began to track northwest now, presumably heading for the Saddle. 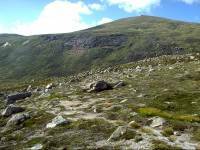 If I'm to climb Cairn Gorm from here I'm going to have to tackle that slope straight ahead. This is probably one of the best places from which to appreciate the bulk and form of Beinn Mheadhoin (the Middle Mountain). 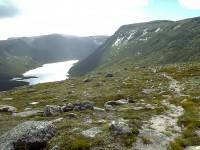 Most guidebooks insist that it's most often climbed from Cairn Gorm; such an expedition very obviously involves a descent to Loch Avon and a reascent of nearly 2000 ft the other side. No thanks. 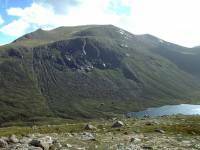 If I ever do climb it, it will be from the Glen Derry path to Beinn Macdui via Loch Etchachan. The path headed south of west once more and I was no longer convinced I was heading for the Saddle; I reckoned it might be contouring down the slope towards Loch Avon itself. I was soon going to have to make a decision to leave it and track northwest. A couple of minutes later, and I still think I'm headed south of where I want to be. But what the hell - this is first class scenery. 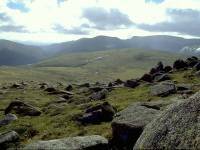 I left the path, reluctantly, and strolled over the shoulder of ground to the northwest, more or less straight for the summit of Cairn Gorm. Within a couple of minutes I found myself at the headwaters of the Nethy. Decision time again. Cairngorm, or Strath Nethy? Frankly, I didn't like the look of the slopes on the opposite side of the Saddle. We're talking unremittingly steep here. The wind was still blowing a severe gale and I was beginning to tire. No, Cairn Gorm was out for today. 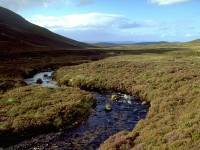 I turned right for the headwaters of Strath Nethy. A few hundred yards down the track I stopped for afternoon tea and studied the map. I got a shock. It was a good seven kilometres from here back to Bynack Stable. Getting on for two hours, probably. It was 3.30 now - I'd not be able to waste any time if I wanted to get the last bus back from Loch Morlich to Aviemore. 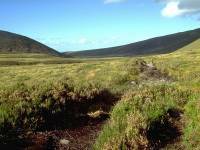 Just after I took this picture two walkers came into view, the first I'd seen since the lone woman on Bynack. I wasn't to see anyone else until I got back to the Glenmore Visitor Centre. Strath Nethy is pretty dreary and featureless. I wouldn't want to be here under grey skies. As the path descends and levels off it starts getting a bit sketchy here and there, and there are occasional patches of slop. The carpet of heather is boring. I found myself wondering if this glen was ever inhabited - it would look so much nicer with a patchwork of pastures, a few stands of trees and a cottage or two. 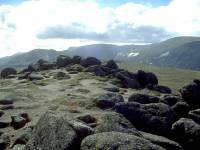 About the only feature of note was this nameless corrie south of Stac na h-Iolaire (eagle crag) in the eastern side of Cairn Gorm's long northern ridge. The view back up Strath Nethy was also getting monotonous. 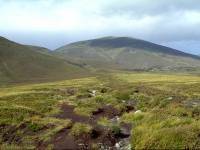 Just a carpet of heather, with the slopes of Bynack Beag to the left. It's not visible in this picture but I'd just caught sight of Bynack stable in the distance. I reckoned I had another 15 or 20 minutes' walk before I turned for home. 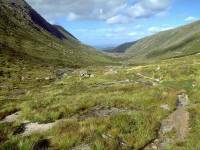 The last half-mile of the Strath Nethy path was the worst, although the scenery improved as Meall a Buachaille reappeared to the northwest. Nearly at Bynack Stable now, and Strath Nethy finally began to look pretty again as Bynack More reappeared in the view. Bynack Stable backlit by the sun. A final view back up Strath Nethy towards Bynack More. Did I really climb that thing earlier today? An uneventful walk back to Ryvoan brought me as far as the outskirts of Glenmore forest, and I was now in comfortable time for the bus. I was captivated by the golden late afternoon sun. I've not often enjoyed weather this good in the Cairngorms. A final shot of the forest track through Glenmore. The visitor centre had just closed when I arrived thirty minutes later, and the little cafe and bike hire shop by the campsite was closed too. A pity, as I'd have welcomed a pot of tea. But the bus came along on time and half an hour later I was back in my hotel room, relaxing after a superb day out in the hills.